Last week when my sister was here, we spent a short time in Rocky Mountain National Park. It was a lovely sunny warm day. After she left, I decided to take advantage of my days off and spend a couple more days there. It started raining shortly after I arrived and didn't quit until it was just time to go home! As you saw from my previous posts, the rain didn't slow down my enjoyment of the park much, though I didn't do as much hiking as I had hoped. Instead, I did some watercolor sketching from the car during the heaviest rain. 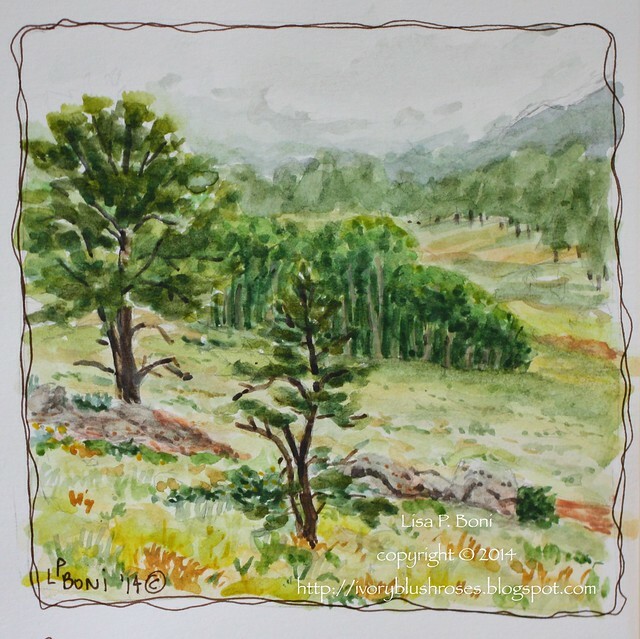 This sketch is of Moraine Park. 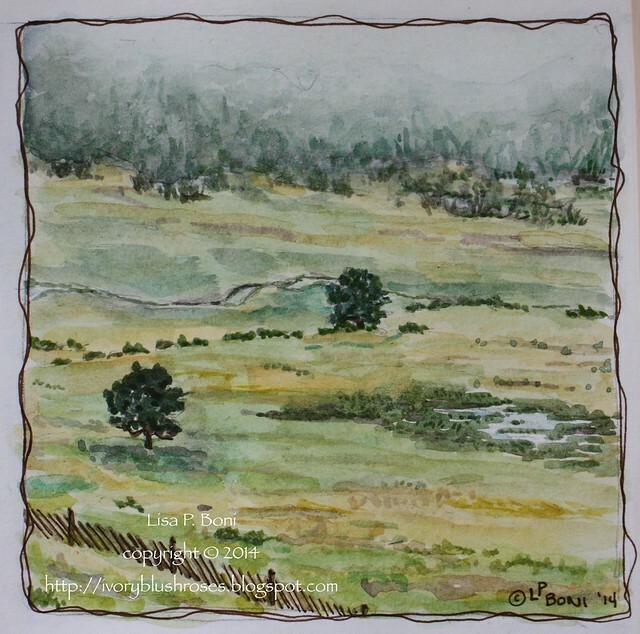 I loved how the clouds where coming down the moraine (the hills on either side of the large flat meadow) and the misty quality of the light. Later the same day, I spent some time at Beaver Meadows doing some birdwatching. The colors were saturated by the moisture and the grey clouds. Another beautiful spot! Lots of mountain bluebirds at this location! Yesterday, I had a chance to pick up my needles for the first time in weeks. 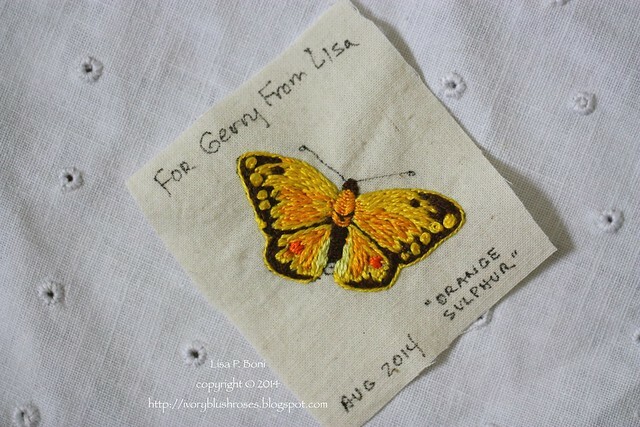 First order of business was a little butterfly for Gerry K. I'm hoping she'll find a home for it on her amazing crazy quilted jacket! Remember all those wilted flowers I had to deal with? This is the lovely bouquet I was able to put together from the remnants! 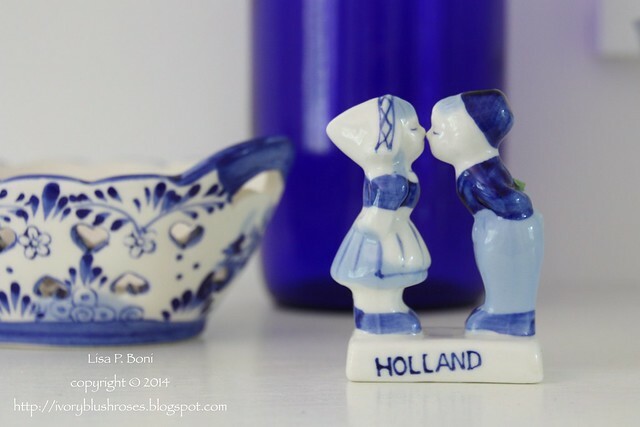 My daughter chose a delft theme and utilized many little things from our Dutch heritage in her wedding. 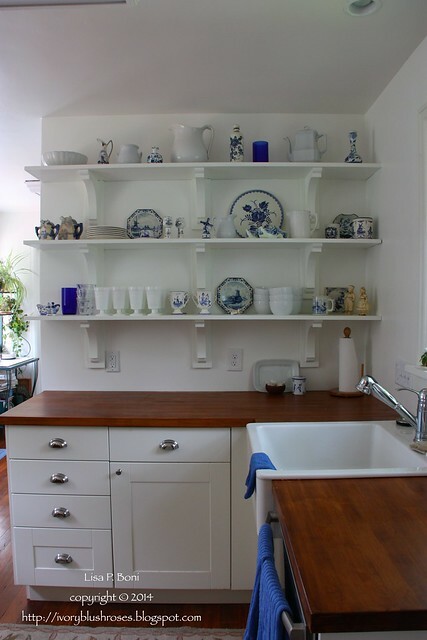 I dressed the kitchen to match, using all of our lovely delft items! I haven't had them all out like this in years. 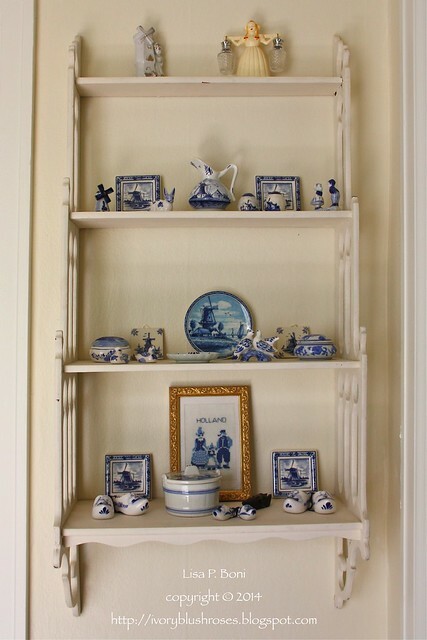 When we had our house fire in 1999, I had lost most of my Delft, but family members gave me many new items and when my parents passed away, I inherited most of their delft pieces. It's a lovely collection now and looks so nice in my white kitchen! So many of these pieces have a story behind them. See the plate on the far right middle shelf behind the two canister pieces? It is the only piece of china left from my kitchen after our house fire. The fire chief called me to come and see a strange thing. While the fire had burned through the flooring, burned the paint and paper covering for the drywall off the walls, melted the metal doorframe and vaporized all the rest of the china and furniture in the room, this plate was still hanging in it's little brass hanger on the wall! The plate above it and the one below it were both gone without a trace. It was literally the only thing salvaged from the kitchen/breakfast area of the house. Everything else was completely gone. 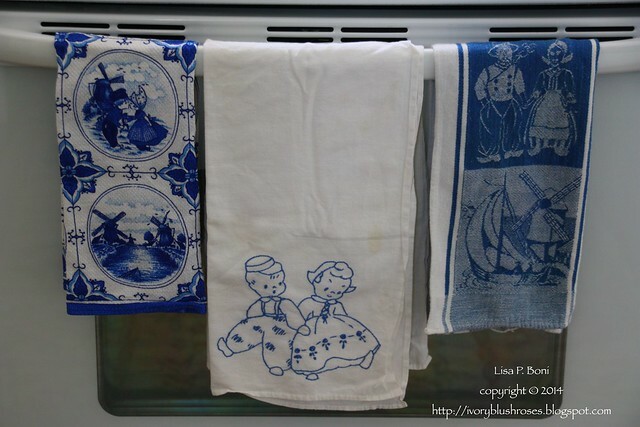 I've managed to gather a few delft themed dishtowels to match the china! With them and some new blue towels and rugs, the kitchen changed from green and white to blue and white for the wedding! At first, Jessie wanted to use this little kissing couple as the cake topper, but later decided against it. I saw the photographer taking it to use as a photo prop, so am looking forward to seeing what they did with it! 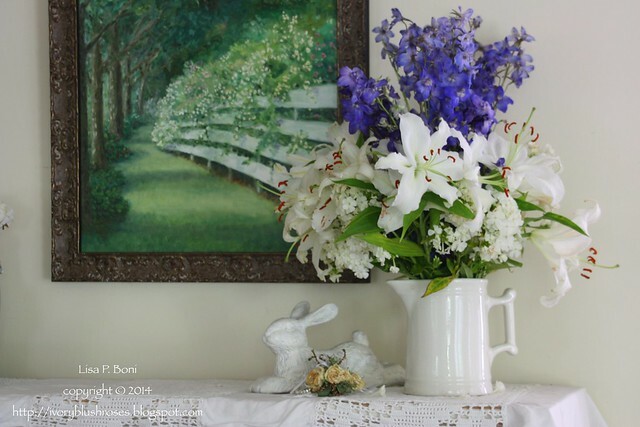 This little white shelf resides in the entryway. 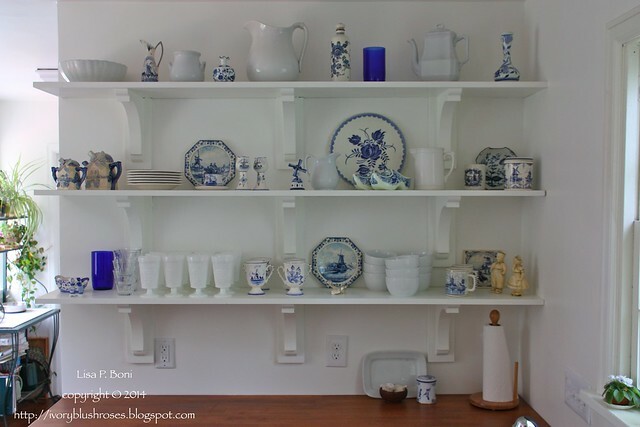 I displayed the tiny delft pieces here that didn't go very well on the kitchen shelves. Many of these small pieces are things my parents brought back from their trip to the Netherlands several years ago when they went to meet our relatives there and do some genealogy research. The little delft bucket with the lid belonged to my great grandparents! I'm not sure where the tiny black wooden shoe came from, but I know it is also old and from the family somewhere along the way. It has been lovely having these little treasures out to enjoy once again! Your sketches are wonderful! They catch the atmosphere of the day. 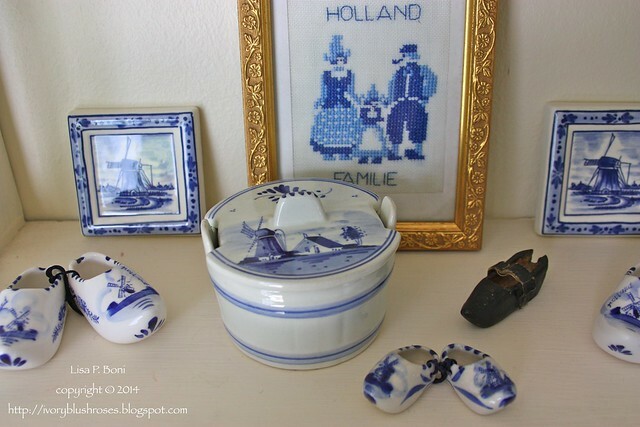 Your Delft collection is lovely. I have a few pieces myself. Stunning Dutchness that touches me deeply like the great masters!